How will the birds respond to an early steelhead run? Home » Notes from the Field » How will the birds respond to an early steelhead run? We have been keeping very busy on the Snake River. At Lower Monumental and Ice Harbor dams we have been tagging juvenile steelhead with Passive Integrated Transponder (PIT) tags. The sampling process includes collecting fish as they pass through the bypass facility at the dam. 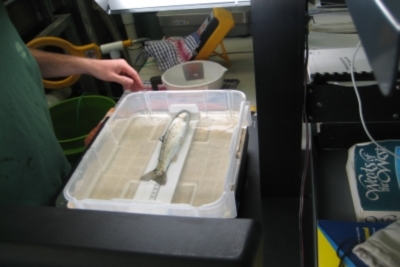 A sample of steelhead is then PIT tagged, photographed, and data is collected on the length, weight, and condition of each fish. The PIT-tagged steelhead are then released to migrate in-river and are detected at other dams and locations along the Columbia River. At the end of the season, various bird colonies will be scanned for the tags, and the number of PIT tags detected will help us determine the predation rates on our PIT-tagged steelhead by colonial nesting fish-eating waterbirds. The data we collect will also help us determine the survival rates for steelhead of all different conditions and sizes. The juvenile migrating steelhead, or steelhead smolts, are running earlier than they have in the past 15 years and we have been sampling the maximum number of fish per week just to keep pace with the run. It has been interesting to compare this year's steelhead numbers with previous years and consider the possible reasons for the changes. We are all curious to see how the birds will respond to the changes in the steelhead run. Steelhead are one of the primary food sources for terns and cormorants, and with a majority of the Snake River steelhead being past the upriver tern and cormorant colonies before their chicks are born, we are curious to see how the they will compensate for this. It will also be interesting to see how this will affect the survival rate of the steelhead smolts. We have already had a significant number of our tagged steelhead make it past McNary Dam, which means they have successfully passed the upriver tern and cormorant colonies on Crescent Island and Foundation Island, respectively. We have also had fish detected passing Bonneville Dam, which is the last dam the fish must pass on the Columbia River before reaching the Pacific. Finally, we have had 71 of our tagged fish detected in a trawl in the upper Columbia River estuary, which means that the fish must only pass the large tern and cormorant colonies on East Sand Island before reaching the ocean, no easy task for these fish that have already run the gauntlet. We’ll soon see what happens.